The CPM Secretariat at a meeting today in the presence of the veteran Mr Jyoti Basu decided that a three-month embargo be made on the state’s present land acquisition process and the industrialisation programme. In the wake of detention in Argentina of controversial Italian businessman Ottavio Quattrocchi, wanted in the Bofors case, the Congress tonight said the legal process must be allowed to work itself out. Terming the detention of Quattrocchi as “curious”, the BJP demanded that the Indian authorities extradite the Italian national. In contrast to the Supreme Court verdict, the Allahabad High Court today gave a breather to the Samajwadi party by dismissing a writ petition seeking the disqualification of the remaining 24 rebel BSP MLAs who had supported the Samajwadi Party help form a government in 2003. 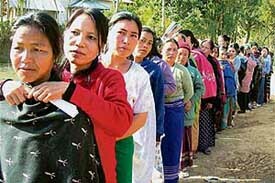 An estimated 75 per cent of the over 3,50,000 voters exercised their franchise today in the third and final phase of elections to 12 Manipur Assembly constituencies at Churachandpur, Tamenglong and Chandel districts and Jiribam subdivisions. The month-long budget session of the Bihar Assembly began on a stormy note today with a noisy opposition frequently interrupting Governor R.S. Garvi from addressing the joint session of the legislative assembly and legislative council. A Division Bench of the Delhi High Court today issued notice to the government over a petition filed by an Army jawan challenging the authenticity of the law degree of the judge advocate general (JAG), a major general who heads the Army’s legal branch. The Ministry of External Affairs said today that the release of seven Pakistanis, who were injured in the Attari Express blasts, for their airlifting to Pakistan yesterday was not linked to an undertaking from the Pakistani authorities for access to them for interrogation. Even as the Congress is yet to get its act together on the issue of imposing President’s rule in UP before Mulayam Singh Yadav goes for the proposed floor test on February 26, the Bihar Chief Minister has advised the BJP to rethink its stand on invoking Article 356 by honouring the views of other NDA partners. Unnerved by the prospect of all-round condemnation, the Rajasekhara Reddy government has withdrawn overnight a gag order seeking to empower the administration to file defamation cases against media and editors. Having burnt its fingers in the Uttar Pradesh fire, it is now the turn of the Cauvery river waters to drown the UPA government. The Election Commission today warned the Uttar Pradesh Government against the transfer of officials ahead of the state elections. Basic healthcare facilities in urban India continue to be dismally alarming, with 180 million urban poor having only 1,083 urban family welfare centres to diagnose their ailments and diseases, according to the Associated Chambers of Commerce and Industry of India (Assocham). The next hearing on Sanjay Dutt’s plea for probation will be taken up on February 28 by the special TADA court constituted under the Terrorism and Disruptive Activities Act to hear the 1993 Mumbai serial blasts. Renowned journalist, literary critic and former Editor of The Times of India Sham Lal died here this morning due to age-related illness. He was 95 and is survived by his wife, two daughters and a son. At least two calls claiming bombs being planted on a Western Railway commuter train and the Ratnagiri Express sent security agencies into a tizzy, but they turned out to be hoaxes, railway police said today. The CBI today conducted searches at 30 places across the country after registering three cases against senior officials of the Income Tax and customs departments. Twelve days of cultural grandeur in Orissa. Shilpa offered lead role in Chicago. Economy to grow close to 9 percent. Chief minister Buddhadeb Bhattacharjee had also been advised to move accordingly. The proposal for amending the Land Reforms Act in the coming budget session of the assembly for re-refixing the industrial land ceiling at a much higher rate was also abandoned in view of the persistent differences among the Left front partners. The meeting, however, reendorsed the state’s industrialisation programme with foreign investment and the private sector. After the meeting held at the Alimuddin Street party office in the morning, Mr Basu said during the next three months, the party leadership at all levels would meet and exchange views with all parties and the land owners and then adopt a consensus on the state’s future land use policy so that mistakes made at Singur and Nandigram were not repeated. Party secretary Biman Bose, who is also the Left Front chairman said the government had moved “very hurriedly” on the land acquiring process at Singur and Nandigram for Tata Motors and Indonesia’s Salim Industries without looking into the pros and cons, which created an unnecessary problem to the government and the party. Henceforth, all important matters would be first discussed and settled at the party and the front meeting before taking only final decision, he added. The Calcutta High Court today asked West Bengal Government to explain the land acquisition process for the Tata Motors plant at Singur, a project that has set off a political storm. A Division Bench of acting chief justice Bhaskar Bhattacharjee and Justice K.K. Prasad directed the state government to file an affidavit explaining details of agreements with land owners for acquiring 997 acres for the project. In his initial reaction after news of Quattrocchi’s arrest, BJP spokesman Ravishankar Prasad said, “Quattrocchi has to be brought to India because he has many things to disclose. Unfortunately, he was allowed to flee when the Congress was in power 15 years ago”. “It was again this UPA government which had released his London bank accounts. We apprehend the government may attempt to repeat its bid to help Quattrocchi. The BJP would raise the issue in and outside Parliament,” Mr Prasad said. “We want this fugitive to be brought to justice through the long arm of law,” he added. Asked about the legal implications of his extradition, Mr Prasad said four high court orders quashing the proceedings against Quattrocchi had been set aside by the Supreme Court with a virtual reprimand. Justices A Kumar and Dilip Gupta rejected the petition seeking the disqualification of the 24 MLAs as unconstitutional, and declared that the “reasons (for dismissing the writ) shall follow”. The petitioners, former Allahabad University student leaders owing allegiance to the NSUI, Raghunath Dwivedi and S P Goswami, had contended that after the 13 BSP rebels had been disqualified by the Supreme Court on February 14, the remaining 24 did not have the requisite one-third strength of the BSP in the UP Assembly to effect a split. The petition had requested for the issue of quo warranto declaring the 24 MLAs disqualified and barred from participating in the proceedings of the House, including the no-confidence motion proposed on 26 February. Earlier, 13 other rebel BSP MLAs were disqualified by the Supreme Court. A total of 37 MLAs had formed the Loktantrik Bahujan Dal (LBD) after splitting in two groups in 2003 and later merged with the ruling Samajwadi Party. No official reaction was forthcoming from the BSP on this latest development. Leader of the party in the House Swami Prasad Maurya expressed ignorance of the details of the order. Meanwhile, the Samajwadi Party (SP) has convened a meeting of its legislative wing on Sunday to work out its strategy to prove its majority in the Vidhan Sabha on Monday. Senior SP leader and Agriculture Minister Ashok Bajpai informed reporters that all party MLAs had been directed to attend the meeting. Claiming that the government enjoys a comfortable majority in the house, the minister said the decision to prove it again has been taken to silence those who have been arguing that the Supreme Court judgement had reduced the government to a minority following the disqualification of 13 breakaway BSP MLAs. The MLAs of the RJD, the Congress, the CPML and the LJP showed placards and raised slogans against the Nitish Kumar government “for failing to deliver in past 15 months “. Amidst interruptions by the opposition, the Governor highlighted the achievements of the 15-month-old NDA government in the priority sector. Besides, he also mentioned about the measures taken by the government for establishing the rule of law and checking crime. Criticising the ruling government, the opposition leader Ms Rabri Devi alleged that the speech of Governor was based on wrong facts and figures. “Crimes like kidnapping, murder, extortion and loot were continuing as usual”, she said. The state budget for 2007-08 would be placed in the house by Deputy Chief Minister Sushil Modi on February 27. The budget session would continue till March 28. The court has directed the government to produce all relevant records pertaining to the service record and qualifications of the JAG, major-gen Nilendra Kumar when the case comes up for hearing next on March 12. The general was also present in court today, sources said. Government counsels who are representing the JAG had strongly argued that the matter be dismissed, but the court was of the opinion that the issue of the notice was warranted. A petition filed by sepoy Netra alleged that the JAG’s degree was invalid because he was posted at a different place when he was supposed to be undergoing the course at Lucknow and, hence, could not have fulfilled the mandatory requirement of attending lectures. The issue has now placed the Army in a piquant situation. On the one hand it is defending the JAG, while on the other hand it is questioning the validity of law degrees of some officers who had obtained their qualifications during the course of their service. This has resulted in the Army taking totally opposite stances on the same issue and in the same court of law. There are six officers from other arms whose transfer to the JAG Department is held up over the issue of their degree. Recently, the military secretary’s (MS) branch circulated a letter asking officers to furnish details of their degrees and whereabouts at the time they were supposed to be undergoing the course. The letter came when the said officers had already qualified in the JAG Departmental examination and had been undertaking regular legal work. One of the officers affected, lt-col Mukul Dev has moved court over his transfer to the JAG Department being held up. He has alleged that in spite of being fully qualified and a clear-cut sanction order of the President for his transfer and availability of vacancies, the MS branch has posted him back to the Artillery. “This request (availability of the evacuated Pakistanis for testimony purposes at a future date) had been made to the Pakistani authorities while conveying the clearance for the aircraft. We drew the attention of the Pakistani authorities to the fact that the terrorist attack on the train is being investigated by the Indian police which may wish to take their statements at a later date. Sources in the JD(U) disclosed to The Tribune that Nitish Kumar had reminded the BJP of the fallout of President’s rule against the Congress and the RJD in Bihar after the February Assembly poll in 2005 when the corresponding sympathy wave had helped the NDA to dislodge Lalu-Rabri in the October-November poll. The order no.938, dated February 20, authorised commissioner, information and public relations, to launch criminal proceedings against newspapers and editors if he felt that the reports/telecast were false, baseless and defamatory in nature. The order kicked up a storm in the Assembly today with Opposition parties insisting on taking up a discussion on the aborted move, and speaker K.Suresh Reddy refusing to allow it, leading to adjournment of the House till Monday. The draconian move had come in the backdrop of the state government's current onslaught against Eenadu media group, and had been hastily withdrawn on Thursday after local media got a whiff of it. As soon as the Assembly met in the morning, a charged-up Opposition pressed for an adjournment motion on the government order (GO). The government had tried to play down the issue; saying that the matter merited no discussion after the order had been withdrawn. Chief Minister Rajasekhara Reddy, who had professed innocence regarding the controversial government order, made light of the issue, saying he had ordered withdrawal as soon as he was informed about it. According to the unprecedented order, the government, after careful examination, could accord permission to the special commissioner, Information and Public Relations, to lodge a complaint and for filing defamation cases through the special public prosecutor against the publishers and editors and to initiate legal action. The government could also ratify the action already taken by the commissioner in having forwarded the cases for legal action. The ruling coalition’s Parliamentary managers were in a tizzy today after the presiding officers of both Houses agreed to the demand of Karnataka MPs to allot time for a discussion on the recent Cauvery tribunal award. Since this is a highly emotive issue for Karnataka and Tamil Nadu, it is feared that any discussion on this will end up derailing the budget session of Parliament even before it has got underway. Lok Sabha Speaker Somnath Chatterjee tentatively promised a short duration discussion to an all-party delegation of Karnataka MPs, including former Prime Minister H.D. Deve Gowda, on this issue on February 26 while Rajya Sabha chairman Bhairon Singh Shekhawat fixed the debate on February 27. Clearly nervous that any discussion on this issue will ruin the rail and general budget shows, Parliamentary affairs minister Priyaranjan Dasmunsi has written to Somnath Chatterjee seeking a change on the discussion as there was no consensus on this issue. DMK ministers Dayanidhi Maran and T.R. Baalu have already threatened retaliatory measures if this discussion is allowed. Dasmunsi has also sought to delay any immediate discussion on this issue on the plea that as per convention, the two Houses must first finish the debate on the motion of thanks to the President and then proceed to other matters. Since the session has to be rescheduled because of the Uttar Pradesh elections, the UPA government’s top priority is to dispose of all financial business and it would not like any major upsets. The UPA government has to do a balancing act on this issue. On one hand, all Karnataka MPs, including Congress members, have joined hands to protest against the award while being partial to Tamil Nadu. The DMK, which is a critical component of the ruling coalition, has expressed satisfaction with the award. It indicated that any backdated transfer orders would be severely punished. The commission has also ordered a blanket ban on any physical handing over or taking over of any charge by any official connected with the election work after Wednesday last. The poll panel has sent the communication to the state government on receiving information about backdated transfer orders being implemented in some districts. The EC had imposed a complete ban on the transfer of civil and police officers connected with election work immediately after the announcement of the poll schedule. As speculation continues in political circles, the CPM, which had put its foot down in opposing the invocation of Article 356, today sought an end to all "political manoeuvring" to bring Uttar Pradesh under President's rule in view of the announcement of the assembly poll schedule in the state. The party asked the UPA government, which it supports from outside, to assist the Election Commission in conducting free and fair poll against the backdrop of apprehension that there will be an effort to ‘distort the democratic verdict’. In a paper brought out by Assocham on ‘Delivery of Healthcare to Urban Poor’, it has been projected that at least 300 additional urban health and family welfare centres per year need to be set up to cater to estimated 215 million urban poor population by 2020, for which plans for budgetary allocations should be announced in the budget proposals for 2007-08. These centres will require a qualified medical and nursing staff of approximately 20,000 to effectively serve and treat the urban poor for their medical ailments. Currently, in urban areas these 1,083 urban family welfare centres are meant to take care of 2,60,000 urban patients while their effective serving rate comes out to be 60,000 patients only. Around 30 per cent of urban dwellers are poor and that urban poverty contributes to approximately 25 per cent of total poverty in India. This population is growing at twice with the pace of the rest of the population. The paper also revealed that due to urban migration and massive inflow of population to the towns and cities, the health status of urban poor and slum dwellers is dismal compared to rural population. There have not been any well planned and concerted efforts to provide primary health care services to these needy class within 2-3 km of their residence. As a result, there is either a non-availability or at times under-utilisation of available primary healthcare facilities. The court will continue to hear arguments as to whether Dutt is eligible for leniency under the Probation of Offenders Act. Dutt who has been convicted for possessing weapons under the Arms Act is seeking probation for good conduct. Under the Arms Act, Dutt faces five to 10 years in jail. Family members said Sham Lal died in sleep at his residence. He had been unwell for the past few days. Prime Minister Manmohan Singh was among the first to condole his death describing him as an "icon" of his time. The cremation took place at the Lodhi Road electric crematorium this afternoon. CBI sources said a case of possessing assets disproportionate to known sources of income was registered against Additional Commissioner of Income Tax Ajay Kumar Singh, who is currently posted in Mumbai. They said 20 places across the country were raided in connection with this case.